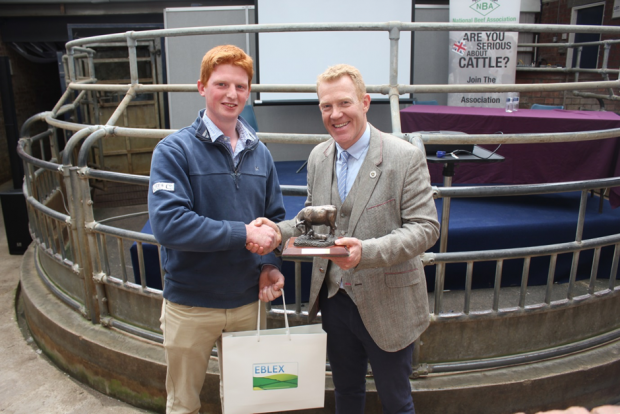 James was the winner in 2015 of the Future Beef Farmer Challenge, held as part of the National Beef Association’s [NBA] Beef Expo 2015 at the York Auction Centre. He lives at Whitfield House Farm, near Whitfield, Brackley, in Northamptonshire. James is 26 years old. He left formal education after taking AS levels and started to work on different farms in his local area before coming back to work in his family’s farm business. The home beef enterprise is a 300 cow suckler herd. Charolais bulls are used as a terminal sire, and Saler bulls on heifers and, more recently, to breed their own replacements. Their cow herd contains mixed breeds but the majority are either Salers X, Limousin X or Simmental X. They are working towards a herd consisting only of Salers X cows. All bull calves are kept entire and are fattened under 16 months old and sold deadweight. Heifers are sold as stores at 12 to 14 months old through local markets, mainly Thrapston. In 2014-15 they joined a Cattle Health Certificate Standards [CHeCS] health scheme to establish a high herd health status in the future. This is the reason for their policy of breeding their own replacements, so they can close the herd. They will continue to buy from Saler Society sales for extra replacements because of the high health status of cattle at these sales. James has bought a few pedigree Salers himself with the aim of establishing a polled pedigree Salers herd, which is a lifetime goal. He believes the future for beef farming is strong, but that the government's poor control of TB is holding the industry back. Too much money is devoted to TB when it could be spent on eradicating BVD and Johnes, which are big underlying problems with in the UK beef herd. He believes that farm assurance could be a lot better, maybe incorporating high herd health schemes. He is sceptical about the use of EBVs because this can reward pedigree breeders that push young bulls to achieving high weight gains which can affect the longevity of that bull for the farmer that buys him.